Two recent events have rocked the publishing world. First, The New York Times, which many regard as the newspaper of record in the U.S., said it would abandon the practice of providing free online content and start charging regular readers beginning in 2011. And second, Apple’s much-hyped tablet — the iPad — made its appearance. What implications will the Times’ decision have for newspaper publishers and other providers of free online content? How will the iPad re-define what a book means, as well as how it is produced, marketed and delivered? Peter S. Fader, a marketing professor at Wharton and co-director of the Wharton Interactive Media Initiative, and Stephen J. Kobrin, a management professor at Wharton and editor of Wharton School Publishing, weigh in on how these developments could reshape publishing. Knowledge@Wharton: We’re here today with Peter S. Fader to talk about The New York Times’ recently announced plan to charge for their content on the web, and the implications of that for other news organizations. Pete, the announcement got a lot of attention but, of course, it quickly faded in the hubbub over Apple’s announcement about its tablet, the iPad. Is the Times’ announcement getting all the attention it should? Is it a really big story? The Times to get this right has huge implications, not just for them, but pretty much for every news and other print media organization. Knowledge@Wharton: Is The Times doing the right thing? Fader: Yes and no. I think they’re doing the right thing by finally admitting that, yes, they need to have people paying for content. They’re doing the right thing by going about this on their own. They’re doing the right thing by being somewhat flexible about how many stories readers can see before they have to pay, and so on. They’re doing the right thing by giving people unlimited access through news aggregators and search engines. That’s all great. But there are some negatives as well. I think by announcing that they’re going to do this, but being completely vague about the pricing, about the specific timing, about the name of it, about what kind of content is or isn’t covered — I think that’s a terrible mistake. They should have their act together, kind of like Apple always does when they make their announcements. So, that’s a problem. Another problem is that they’re focusing so much on the negative. It’s interesting that what The New York Times is doing here is largely identical to what The Wall Street Journal has done — and The Wall Street Journal has succeeded with it. But what we keep hearing about is, “Oh my goodness, I’m going to hit a wall after I read a few articles.” The Times should be emphasizing the good stuff, the things that readers will be able to do that they couldn’t have done otherwise — some value-add. They’ve been messing around with a lot of tools along those lines, but they’re really not emphasizing them in this announcement. Knowledge@Wharton: Now, a lot of people who are watching this from the sidelines are probably saying to themselves, “Why should I worry about The Times or other news organizations? I get my news from the web.” I’ve heard a journalism professor suggest that, “Well, that’s a lot like saying, ‘I get my produce at the grocery store. Why should I worry about farmers? '” What do you think about that? Fader: That’s a great analogy, and of course, a terrible mistake. I believe that these content creation organizations such as The Times have a huge role to play. Even if there’s a zillion of them out there, an organization like The Times–they’re a tastemaker. They’re not only creating content, but they’re also telling us what content we should be paying attention to. We trust them for their ability to shape our interests. There’s a great and sad analogy with what’s going on in the music industry, where we all figure the record labels will just go away, because they’re not savvy about digital this and that. But even though they’re not very good at being marketers, or very customer friendly, the labels are wonderful, in the same way, at identifying good artists and basically telling us which ones we should be listening to — and, for the most part, we pay attention to that. There always will be a few iconoclasts out there who would rather find stuff on their own. They enjoy the hunt. But for most people, they just want to have things served up to them. A lot of people go to The New York Times not only to see The New York Times‘ own unique opinion on things, but just what stories they should be paying attention to in general. Knowledge@Wharton: So, what does success look like for The Times in this effort? Fader: That’s a good question. The Times has hinted at it, in a number of the interviews. They’ve said they want to maximize revenues. They want to bring in as much as they can for the news, and they don’t care whether it’s print or on-line or whatever. That sounds noble, but it’s also shortsighted. Yes, indeed, a company wants to make more revenues rather than less — but they don’t want to be doing it over a particular quarter, or over a particular year. They want to be doing it over the lifetime of the customer. So, The New York Times should be setting up this service — and the content that will go through it — in a way that’s going to get people to stick around for a long time, and consume for a long time; not just to consume a lot, and then go away. They should be thinking about success metrics like lifetime value, and the overall discounted value of their base of current customers and the future ones that they’ve yet to get. I think if they start thinking longer term, rather than just, “What can we do today?” they’re more likely to develop a customer-friendly service, as well as more refined success metrics, to know if they’re really achieving success. Knowledge@Wharton: Can they sell that kind of long-term outlook to their shareholders? I do think that The Times is going to be around for a long time. There are certainly plenty of other newspapers that are disappearing — and more will continue to disappear. But The Times brand is a really powerful one. There’s a generational issue — a lot of people who will cling to the old paper copies as long as they can. The Times needs to count on that, instead of panicking and doing things just to try to salvage revenues. They need to be thinking further out there. This announcement is a reasonably good sign along those lines, but still not perfect. Knowledge@Wharton: Now, there is some talk that The Times has been thinking about the pay curtain because products like Apple’s new tablet might allow them to do that. Do you think that the timing was related to the tablet announcement? Fader: It could be — and it would be said if that were true. I’ll say this in a couple of ways. Number one, The Times is very, very, very late — years too late — with this. They dipped their toes in the water with Times Select. It wasn’t a perfect service, but it was a decent one, and they should have stayed with it and expanded it, and stuck with that brand that they were building at the time, instead of just abandoning it, and starting from scratch. So, they’re years late. Is this timing associated with Apple’s recent announcement? Maybe; I have no idea. But as I said before, this device, while it’s exciting, and it’s going to change the way a lot of us deal with different kinds of content — I believe that getting this business model right far transcends the existence of any particular device. The vast majority of people who will be using this Times service will be doing so on a plain old desktop, or perhaps on a mobile phone. Only a small fraction of them will be doing it on this device, as wonderful as it is. Knowledge@Wharton: There’s been a lot of talk related to the device, about a model that might emerge similar to the iTunes store. But publishers have some concerns about that, don’t they, in terms of being able to maintain a direct relationship with their customers, instead of having Apple act as an intermediary? Fader: If we learned one lesson from the whole music mess — and maybe from the whole dot-com revolution — it is exactly that point. It’s very important for content creators to have some say in how their product, how their service is being delivered, who’s using it, and how it’s being monetized, and so on. If I can excuse The Times for being late in one way, it would be for this reason — that they have decided they want to build it on their own, rather than outsourcing it to iTunes, or to other services that would provide that kind of intermediary role. I think it is very important for The Times to maintain and enhance direct contact with their readers. This will allow them to know who’s doing what, to have a direct sense of what kinds of stories and what kinds of functionality they could be offering. I wish they could have done it sooner. I hope they will do it effectively. Again, it’s important for them to own the pipes to the consumer. Knowledge@Wharton: Assuming that the migration of advertising from print to on-line media continues at current levels, and The Times starts to collect some revenue from its on-line operations, do you think it’s possible for them to collect enough revenues to sustain their news gathering infrastructure of correspondents all over the world? And what about other, more local news organizations? Are there enough revenues from an on-line subscription model to support that kind of infrastructure? Fader: No. I think the ad-based model will never disappear entirely. I do think that there’ll be a segment of users who will pay more to get it without ads. I think that what Pandora has done in the music space is a great example, where depending on how much you pay not only controls the amount of content you get, but also whether or not you get ads, or how often you get ads. So, there’ll be a group of people who will pay more to get no ads. There will be a group of people who will pay less because they either don’t mind getting the ads — and, dare I say this, some people actually like getting the ads, and it’s not a big burden for them. They can skip past them, or sometimes find them informative. So, there’s still a role for advertising, albeit smaller. Announcing a service like this gives them the flexibility to let people have the service their way. It’ll be great to see these simultaneous business models exist. Knowledge@Wharton: So do you think we will see lots of business models emerging, with multiple business models succeeding in various ways, and some falling by the wayside? Fader: Sure. And, of course, there could be a lot of micro-models within a model. One of the big questions that a lot of people are clinging to in this particular case is, what about the crossword puzzles? Will I get those with my Times subscription? Will I have to pay extra for them now, as I currently have to do? Now, that’s not a big deal. That’s not the future of the paper. But it is a relevant issue that should have been dealt with in advance. The fact that people are asking those questions and not getting answers is a troubling sign. They can put together different kinds of bundled services. Again, some could have advertising, and others may have no advertising. Crossword puzzles could be included or excluded. Some of the other services could include their social networking capabilities, the Times People, and so on. A lot of these things can happen. They can see which ones will work and which ones won’t, but it will be based on a market mechanism, as opposed to legal restrictions, or their inability to get the information technology right. Let’s let a thousand flowers bloom. Knowledge@Wharton: We’re here with Stephen J. Kobrin to talk about some developments in the world of electronic publishing: The New York Times announcement that it would start charging its most prolific readers on-line for access to its web site in 2011, and the highly anticipated introduction by Apple of its iPad tablet computer. Thanks for joining us, Steve. Stephen J. Kobrin: Thank you. Knowledge@Wharton: Both these announcements could have a significant impact on revenue generation and distribution models in the publishing world. 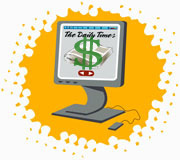 Let’s start with The Times pay curtain, which is expected to go up in early 2011. The company has not revealed a lot of detail about this plan, but it did say that readers who only encounter The Times occasionally will still be able to do so for free. But readers who consume The Times content on a regular basis will be asked to pay. How much they’ll have to pay, how they’ll pay, and the threshold for having to pay are not yet clear. But even with one year of warning, do you think people will be willing to subscribe or make micro-payments to read The Times content on-line? talk about micro-payments first. If we come up with the means that facilitate micro-payments that’s easier than giving someone your credit card, I think people will pay for content. For example, if we can find a way to just click, as you do with iTunes, and very quickly pay 75 cents or a dollar or whatever, that could work. But it’s going to probably have to be more than one article. Now, in terms of subscriptions, I think that certainly could work. The Wall Street Journal is a subscription site. It seems to be working. As people move to consuming content on-line, as people move away from the print paper, to the extent they do — and when they consume it primarily on-line, they’re going to be willing to pay for it. Knowledge@Wharton: If The Times model succeeds, do you think it could work for smaller regional and local newspapers? Are there enough readers who are sufficiently interested in that kind of news to support the infrastructure it takes to deliver the product? Kobrin: The problem is, the number of people who read a big city daily has diminished tremendously over the last decade or two. So, the question is twofold. One, are there enough people interested in reading a big city newspaper? And two, what percentage of those will pay to access the information on-line? Knowledge@Wharton: So, it may be a matter of scale whether this is going to work or not. Kobrin: Sure. Now, it is possible that a form of urban on-line paper could emerge that’s different than anything we’ve seen, and it may not be an existing newspaper. It may not be The Philadelphia Inquirer. It may be some source of local news that people are willing to pay for, especially if it includes, for example, some equivalent of classifieds, social announcements, et cetera. Knowledge@Wharton: Another revenue model for all kinds of publishers could emerge from a product like Apple’s much-hyped iPad. Even before its introduction, the iPad was breathlessly described as the most important tablet since The Ten Commandments, the savior of newspaper, magazine, and book publishing. It’s out now. Do you think from what you’ve seen that it comes close to the hype? Kobrin: I think nothing could come close to the hype. And the interesting thing is that the hype wasn’t from Apple. It was all created externally, by people interested in the tablet. It’s one of the greatest marketing campaigns with very little effort in history. I don’t know if it comes close to the hype. I think devices like the tablet could revolutionalize publishing. The Amazon Kindle and the Sony reader are wonderful ways to carry books around. But it’s essentially the same experience as reading a print book. It’s a flat book, it’s the printed word. You can do things such as adjusting the type size. You can carry lots of books in a small space. But the experience is very close to reading a print book. The Apple tablet allows books to take on a different meaning. One, it isn’t clear that every book has to be 350 or 400 pages, if they’re published electronically. Two, if the tablet is going to succeed, it’s got to have active content. The number of people who want to read War and Peace on the tablet simply as the printed word is limited. Where the tablet will be valuable is when books begin to contain video and when they contain graphics. Business books could contain, for example, spreadsheets, models and charts that are active. Knowledge@Wharton: You mean an interactive element, in which you could — take some of the lessons you’re learning, and apply them to a spreadsheet. Kobrin: You can illustrate a model or an idea with a spreadsheet. You could use graphics to illustrate alternative scenarios. You can embed video. What’s critical is that it has to add real value; if it’s simply fun and games, it will disappear very quickly. It has to be content that adds value to the reading experience and not simply add-ons just to take advantage of what the tablet can do. Knowledge@Wharton: Publishers are understandably wary of adopting distribution and revenue model similar to Apple’s iTunes store, where Apple inserts itself as an intermediary between the music industry and consumers. Do you think it’s likely that there will be some model that emerges that will make everybody happy? Kobrin: There’s a big difference between the music business and publishing. If you listen to music on an iPod, at the end of day, it’s no different than listening to the music from a .33 rpm record. The music is being played. You hear it, you absorb it. It’s very different when you’re talking about a book on a computer. If it’s going to be successful, it has to be a different experience. If it simply replicates the printed page, you haven’t solved much. You haven’t provided much that’s new. Until we understand what “the book” is going to look like on the tablet, it’s hard to think about the business model. For example, we may find that we have a lot more shorter books. We may be able to have a lot of books that sell fewer copies and are still profitable. There are all sorts of possibilities. Until what a book looks like emerges, it’s hard to talk about business models. Knowledge@Wharton: And it’s not clear at all what a book is going to look like. Knowledge@Wharton: Already, we have several different technologies that we can turn to for that. Kobrin: At this point, the single most important reason for buying a book is that you saw it in a bookstore. People buy books through Amazon. They buy books because their friends tell them about it. But still, the single most important factor is you’ve seen it, physically, in the bookstore. If that goes away, there’s a real question about how we create awareness of a book, of how we lead the reader to a book, and help him understand that the book is available. That’s going to be a major issue. How do you replace physical distribution in a bricks and mortar bookstore, and the awareness that generates, when people walk in and look at the book, with a virtual presence on-line? Knowledge@Wharton: Another distribution model is the one pioneered by Amazon, in which they let regular customers know that a title is available that, based on their previous purchases, might be something they’re interested in. Kobrin: In the last year, how many books have you bought because Amazon let you know that titles were available? Knowledge@Wharton: One out of 50 or 60, perhaps. Kobrin: In some ways, that answers the question. I’m not sure it’s a terribly effective marketing technique. I think what will evolve — what will have to evolve — are new ways of letting people browse the content. Amazon, for example, will let you look at a chapter of a book. They’ll let you look inside a book. One of the interesting things about a Kindle is that you can generally download the first chapter of any book before you buy it. That gives you a sense of what the book is about, the author’s style, et cetera, and then you click on “buy.” That’s very effective. Again, the question is, how do we get people to download that first chapter? Or get them to look at the book or look inside the book? When there’s an almost unlimited number of books available on-line, awareness is a problem. Knowledge@Wharton: If we are building a model for the future in which we’re redefining what a book is in terms of value-added content — including graphs and video — that makes producing a book a much more complicated process. That, in itself, has to change the publishing business. Do you think there’s an infrastructure that is ready to tackle that kind of task? Kobrin: I think it will emerge. I’m not sure how well developed it is at this point. But there’s a trade-off. The primary task is still there. You need to structure a book in the way that’s interesting to readers, communicates information, flows, is easy to read. Some of the new add-ons — graphics, videos, et cetera — will be costly. The trade-off is, you no longer have to print the physical book and you may not have to distribute it through brick-and-mortar bookstores. It’s the latter that tends to be expensive and time-consuming. Knowledge@Wharton: We don’t see a free model emerging for books like the newspapers adopted, do we?